BaltCap Growth Fund (BGF) will invest close to €3 million of growth capital in Viru Haigla AS in order to expand the Pihlakodu chain of modern elderly care homes, and increase the number of beds to one thousand over the next four years. According to BaltCap’s Associate Director Sten Sonts, Estonian social care services for the elderly have not seen much development during the past few decades, whereas general welfare has grown significantly during the same period. „In less than a year, Pihlakodu has set a new industry standard in elderly care, and given the demographics in Estonia, this is an industry with a clearly growing demand offering an attractive long-term investment opportunity,” explained Sonts. „As soon as we complete the modern Pihlakodu home in Tabasalu which can accommodate 200 residents, we plan to start building another one in Viimsi,” said Igor Pihela Snr, Chairman of Viru Haigla AS Supervisory Board describing the next steps of the company. „Our objective is to use the investment to reach one thousand nursing home places during the next few years and strengthen our leading position as provider of quality social care services in Estonia,” he noted. This is the first investment of BaltCap Growth Fund (BGF) in Estonia. €3 million will be invested in combination of equity and debt. As a result of the transaction, BaltCap will acquire a minority shareholding in Viru Haigla AS whereas Estonian Medical Group owned by Estonian investors Igor P ihela Snr, Igor Pihela Jr, Priit Pihela and Ermo Kosk continues as the majority shareholder. The Group is financed by LHV Pank. Pihlakodu is the leading chain of modern elderly care homes in Estonia, providing social care services in Tapa, Kohtla-Järve and since last year also in an elegant building in the historic Nõmme district of Tallinn. Once the Tabasalu elderly care home is completed in September, the chain can offer almost 500 nursing home places for the elderly. The investment in Viru Haigla AS is not the first growth capital investment by BaltCap related to the healthcare and healthy living. In 2019, BaltCap Growth Fund invested into Livinn/Biosala, the leading chain of organic products in Lithuania. In 2018, the predecessor growth capital fund by BaltCap Lithuania SME Fund sold InMedica, leading chain of 18 primary care and specialized outpatient clinics in Lithuania to INVL Baltic Sea Growth Fund. The same fund still owns the operator of 29 Lemon Gym and Impuls fitness clubs. BaltCap established BGF in cooperation with the Baltic Innovation Fund (BIF) to invest in rapidly growing sector leaders. BIF is a fund-of-fund created by the Estonian, Latvian, and Lithuanian governments and the European Investment Fund (EIF) to boost equity investments into Baltic companies. BaltCap Growth Fund (BGF) has signed an agreement to acquire 100% of shares in UAB Sveiki Produktai (Livinn) and UAB Bio Sala (Biosala), two leading retail chains of organic products in Lithuania. The transaction is subject to competition clearance. Livinn and Biosala are two leading retail chains of organic and healthy food and non-food products in Lithuania. Companies are offering specialized, carefully selected assortment, as well as professional in-store assistance about product specifics, such as nutritional value or allergens. Together, they sell products through 18 retail stores across largest towns and online shops. “Globally, free-from and organic are some of the fastest growing sectors in food retail. Wellness-worried shoppers are increasingly looking for better availability of organically-sourced products and professional guidance. Founders of Livinn and Biosala developed strong and trusted retail brands. Today, we are proud to support both companies in their journey forward,” says Marius Miskinis, Associate Director of BaltCap Growth Fund. SPC Legal acted as legal adviser to BaltCap. ”Developing company as a founder requires lots of dedication, creativity and constant enthusiasm, which at some point becomes insufficient to support further growth. New business-oriented owner with financial backing enables growth, while our team’s intrinsic values, such as focus on product purity, quality and environmental friendliness will ensure that clients are happy going forward,” says Guoda Azguridiene, one of the founders of Livinn. The deal is a second investment by BaltCap Growth Fund. BaltCap Growth Fund was established by BaltCap in cooperation with the European Investment Fund through the Baltic Innovation Fund and with the investments from Baltic pension funds managed by Swedbank and Luminor. BGF is a continuation of growth capital strategy for BaltCap with first growth fund established in 2001. BGF invests in fast growing and profitable companies, potential sector leaders in the Baltics and beyond. We typically invest in growth of the company by increasing its production capacity, developing a new product range, entering new markets or acquiring a competitor. We can also buy out shareholders looking for a liquidity event or finance management buyouts. BGF aims to invest between €2-4 million of equity per portfolio company acquiring majority or influential minority stake. 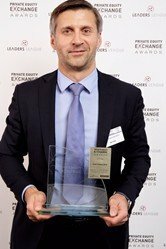 We are proud to announce that BaltCap gained an honorable recognition by winning the gold award at the 17th edition of the Private Equity Exchange & Awards Ceremony held on November 21st in Paris. We won the Best Eastern European Award. 1,200 participants – Limited Partners, Private Equity Funds and Corporate Executives – gathered for this major Pan-European summit on private equity and restructuring followed by a high-class evening ceremony rewarding the best performers among LBO Funds, Limited Partners and Management Teams. BaltCap was nominated in the category Best Russian & Central and Eastern European Private Equity Fund. We have been nominated in the same category before but this year we finally managed to outshine the other 7 nominees and bring home the golden prize. The award was received by our Partner Sandijs Abolins-Abols (in the photo). Acknowledged by the major European Private Equity players, this event highlights top performers of the Private Equity scene. 80 jury members, top Limited Partners and Asset Management professionals, committed themselves to assess the application forms submitted by carefully preselected nominees. Laureates were rewarded on stage in front of 450 private equity players. BaltCap Growth Fund (BGF) has signed the shareholder agreement to become a significant shareholder in KOOL Latvia with an approximate 30% stake. In return, KOOL Latvia, a newly developed local petrol and convenience store chain will obtain higher growth capital, enabling the company to accelerate further expansion. KOOL is a new innovative brand in the Latvian petroleum retail market with a fresh and contemporary concept. KOOL’s strategy relies heavily on competitive pricing as well as on premium customer experience, by offering carefully selected and locally sourced foods. Since launch, KOOL has attracted over 7.5M€ funding from the various local entrepreneurs as well as private and institutional investors. “We have been following KOOL’s development closely since its launch and are impressed by the high-performance management team as well as the effectiveness of the concept itself. We believe KOOL has strong grounds to become a significant player in the Latvian petroleum retail market by becoming a credible local alternative to the large foreign players,” says Martins Jaunarajs, Partner of BaltCap Growth Fund. “We are very pleased that the leading investor in the Baltics has highly evaluated KOOL’s concept and decided to invest in us. The investment will help us further develop the KOOL chain by opening several new petrol stations and convenience stores by the end of 2019. We are convinced that KOOL will be a very competitive player in the market, which has been already proved by existing petrol station performance results and consumer loyalty,” says Sandis Steins, Board Member of KOOL Latvija. BaltCap Growth Fund (BGF) was established by BaltCap in cooperation with the European Investment Fund (EIF) connected to the project through the Baltic Innovation Fund (BIF). The BIF is an initiative created by cooperation between the Republic of Estonia, the Republic of Latvia, the Republic of Lithuania and EIF. Investors also include Baltic pension funds managed by Swedbank and Luminor. The fund provides growth capital to small and medium-sized enterprises in the Baltic countries. For further information, please visit BaltCap’s website: www.baltcap.com. KOOL Latvija LLC was established by private investors and ZGI-3 fund in October 2016 with an idea to create and expand petrol retail chain in Latvia. The first petrol station was opened in September 2017. Currently, KOOL Latvija is operating four petrol stations connected with convenience stores as well as one stand-alone store. An additional KOOL petrol and convenience store will be opened in November 2018 in Riga. BaltCap has entered into an agreement to sell its 54% holding in InMedica to BGSF Sanus, a subsidiary of asset management company Invalda INVL. BGSF Sanus will transfer the investment to the INVL Baltic Sea Growth Fund when the fund starts its investment activity. InMedica is a leading chain of primary care and specialized outpatient clinics in Lithuania with 18 clinics in seven cities. The transaction is subject to fulfilling closing conditions, including competition clearance. BaltCap Lithuania SME Fund acquired the shares of the company in 2012, when it had five clinics. “Over the last six years, InMedica has actively consolidated the market by acquiring existing clinics, has opened three new facilities and enhanced its service offering. As a result, the company more than quadrupled its revenue. Special credit and big thank you goes to the management team who led this development. We are pleased that the acquirer has recognized InMedica’s strategic position and confident it will take the business to the next level,” said board member of InMedica and Partner of BaltCap Kornelijus Čelutka. “We rate InMedica as one of the strongest players in Lithuanian healthcare market. We believe that private healthcare sector has high growth potential both in Lithuania and the Baltics, and we will seek to create a leading company in the sector,” said Nerijus Drobavičius, Partner of the INVL Baltic Sea Growth Fund and the Director of BSGF Sanus. InMedica is acquired by BSGF Sanus, a 100% subsidiary of Invalda INVL. Once the INVL Baltic Sea Growth Fund begins its investment activity, it is planned that the ownership of BSGF Sanus will be transferred to the fund at acquisition cost. INVL Baltic Sea Growth Fund is managed by INVL Asset Management, the company of Invalda INVL group. “We are grateful for BaltCap’s support. It was a true strategic partnership that created value for both our clients and our shareholders. Today, we look forward to further growing and strengthening the business under the new ownership of experienced financial investor,” said Laura Penikiene, General Manager of InMedica. Alpha Advisors acted as financial adviser to BaltCap, TGS Baltic as its legal counsel. The deal would be seventh successful exit by BaltCap this year. For Lithuania SME Fund it would be fifth exit if all deals signed this year are closed. Four more companies are left in the portfolio – Impuls LTU, Labochema, Ygle Pastatu Valdymas and Trafi. The Lithuania SME Fund is a growth capital fund of BaltCap which started to invest in 2011. The fund’s main investor is the JEREMIE Holding Fund which is managed by the European Investment Fund (EIF). The fund’s other investors are major Baltic financial institutions, including pension funds operated by subsidiaries of Swedbank, Luminor and LHV. Also, the sale of InMedica is not the first exit by BaltCap in the healthcare sector. In 2013, the fund manager sold Quattromed, a network of laboratories in Lithuania, Estonia and Finland, to Synlab, one of the biggest European providers of laboratory services. BaltCap still owns Unimed Grupp, the largest dental care provider in Estonia, and Qvalitas, an occupational health care service provider. BaltCap and shareholders of UAB Keturi Kambariai have entered into an agreement to sell 100% of the leading Baltic coffee shop chain Caffeine to Reitan Convenience. In the Baltics, Reitan Convenience operates the Narvesen, R-kiosk and Lietuvos Spaudos chains of convenience stores and kiosks. The transaction is expected to close after receiving competition clearance. Terms of the transaction were not disclosed. “Over the next five years, we plan to increase the number of Caffeine-brand coffee shops and to expand geographically. We have a lot of ideas for enhancing form and content, we will continue to promote the culture of drinking coffee, and we will implement new roasting and production solutions. Reitan Convenience is focusing on customers, employees, and the development of new and existing stores. They have accumulated a lot of experience in the market and will be extremely important to us as a source of both advice and assistance. BaltCap has been an attentive and confident partner, and we are grateful for the opportunities they have provided,” said Nidas Kiuberis, Head of Coffee and Communications at Caffeine. BaltCap, the largest private equity and venture capital investor in the Baltics, exited Latvian bath cosmetics company Stenders SIA. The company was acquired by Chinese institutional investor CICC Ehealthcare Investment Fund. Stenders develops, manufactures and distributes bath cosmetics products. Stenders has its own stores in Latvia and several franchise partners across Europe and in China. BaltCap invested in the company in 2013. During the holding period, Stenders expanded their product line considerably to improve customer loyalty. The company has laid a good foundation for further international expansion of the brand. The new BGF with a target size of EUR 50m will provide growth capital to 15-20 companies to create regional market leaders and increase exports, being a brand-new instrument in a market with such an investment focus. BGF held its first close at EUR 40m and it is managed by the experienced pan-Baltic investment team, in which Heidi Kakko and Marek Kiisa are the newest additons to the BaltCap team in Estonia. According to BaltCap’s estimation, the demand for growth capital remains high in the Baltic states while the opportunities for growth are very good in both traditional and new industries of Estonia, Latvia and Lithuania. The SMEs of the region are in need of investments to maintain their competitiveness and increase their productivity. BGF Partner and Investment Committee Member Heidi Kakko commented that demand for a new type of fund to enter the market is very high. “Until now, Estonia, Latvia and Lithuania have had scarce opportunities to finance the growth of companies with a turnover of 1-5m EUR per annum. At the same time, there has been a need for capital for further growth for such companies and this is where BGF will fill a significant gap,” she said. Another new Partner of BGF, Marek Kiisa added that the new fund will focus mainly on investments ranging from 0.5 to 3m EUR. “It is also important to mention that finally local pension funds will be able to make direct investments to small and medium-sized enterprises in the Baltics,” Kiisa said. Martin Kõdar, the Managing Partner of BaltCap admitted that one of BaltCap’s biggest strengths is highly professional experienced team. “We are glad to welcome two new investment professionals – Heidi and Marek – to join our team and launch the new fund. Our dedicated growth investment team, led by Kornelijus Celutka in Lithuania and Martins Jaunarajs in Latvia in addition to the new team members in Estonia, is certainly one of the main reasons why pension fund investors have trusted BaltCap to manage this new fund. We are also grateful for EIF’s continued support to BaltCap and BaltCap Growth Fund,” he said. BaltCap Growth Fund is a continuation of growth capital strategy for BaltCap. In 2001, BaltCap established its first growth strategy fund, the Baltic SME Fund, which was followed by two JEREMIE initiative funds in Latvia and Lithuania, established in 2010-2011. BaltCap Growth Fund is the fifth fund introduced to the market by BaltCap with the support of the European Investment Fund within the framework of Baltic Innovation Fund’s initiative, a programme supported by the Republic of Estonia, the Republic of Latvia and the Republic of Lithuania and the EIF, as well as local pension funds. The Baltic Innovation Fund is an innovative investment initiative created by cooperation between the Republic of Estonia, the Republic of Latvia, the Republic of Lithuania and EIF that is unique in its nature across Europe. The Baltic Innovation Fund will invest EUR 130 million into private equity, mezzanine and venture capital funds focused on the Baltic States during 2013-2017. It is a key initiative with EIF partnering with three important national agencies – Altum (Latvia), KredEx (Estonia) and Invega (Lithuania). This unique trans-national process provides a real opportunity to further develop the Baltic PE & VC market. BaltCap has secured commitments to establish a new regional fund to provide growth capital across the Baltic region for small and medium-sized (SME) companies. The new fund would target both local and pan-Baltic companies who want to create new products and services, accelerate organic growth or acquire businesses with an ambition to grow and become the market leaders. The new regional fund is formed jointly by BaltCap, European Investment Fund (EIF) investing through Baltic Innovation Fund (a Fund-of-Fund initiative between EIF and the governments of Estonia, Latvia and Lithuania acting through their respective national agencies KredEx, Altum and Invega) and local pension funds thus enabling latter institutions to invest into Baltic companies to strengthen their equity. The target size of the Fund will be EUR 50m. Estonia, Latvia and Lithuania are showing strong fundamentals for growth opportunities in both traditional and new industries across all economic sectors. “SME companies of the region need investments to maintain competitiveness and increase productivity. We see that demand for growth capital remains strong in the Baltics,” said Managing Partner of BaltCap, Martin Kõdar. “Total private equity investments in the region are 50% of the EU average. The ratio has improved for venture capital investments in recent years, but there is still a shortage of growth capital for SMEs and we want to fill the gap,” added Kõdar about the purpose to raise a new fund. BaltCap has already secured commitments from institutional investors of more than €40 million, and has submitted an application to the Estonian Financial Supervision Authority for registration of the management company, which is required for the establishment of the Fund. After obtaining necessary registrations, the Fund can be established, and start its intended investment activities. The investors who have already made their commitments to the Fund include Swedbank pension funds, DNB pension funds as well as EIF investing through Baltic Innovation Fund. Upon establishment, this fund would be a continuation of growth capital strategy from BaltCap. In 2001, BaltCap established its first growth strategy fund, the Baltic SME Fund, which was followed by two Jeremie funds in Latvia and Lithuania, established in 2010-2011. Impuls LTU, the operator of Lithuania’s biggest fitness chain Impuls, is to acquire Estonia’s Arctic Sport Clubs creating the first pan-Baltic fitness centre operator in this region. The company signed a share purchase agreement with the Estonian chain operator on Wednesday. Sales of Arctic Sport Clubs are expected to reach EUR 2.3 million in 2015. Impuls LTU and Arctic Sport Clubs announced that Impuls LTU will acquire all of the outstanding shares of the company that owns the Arctic Sport Club chain. The acquisition will be financed by Nordea Bank and BaltCap Lithuania SME Fund and is anticipated to be competed by 2015 year end. It is currently pending the approval of the Estonian Competition Authority. “We spent significant time planning and coordinating the acquisition of Arctic Sport Club, one of the leading industry players in Estonia. The Arctic Sport Club chain complements well the Impuls Group’s focus on delivering best experience to clients – the company’s fitness centres offer a complete range of high-quality fitness services, and feature the latest fitness equipment and swimming pools. Arctic Sport Club will remain under the leadership of its current management team. This is because Impuls LTU highly values the achievements of the members of this team and intends to continue the company’s development in Estonia with their help,” said Impuls CEO Vidmantas Šiugždinis. After the opening of Lemon Gym fitness club in Riga in January 2016, Impuls LTU will become the first fitness centre operator present in all three Baltic states. The Group plans to pursue growth in the Baltics through its premium-brand Impuls and low-price Lemon Gym chains. Arctic Sport Club owns two 2,500 sq m fitness centres in Tallinn and Tartu. Both centres offer a variety of fitness services including full-service gyms, fitness classes and personal training, and feature 25m swimming pools. The fitness centres employ a total of 89 staff members. The company has more than 4,000 regular members, rising Impuls Group’s total membership close to 30,000 following the acquisition. “We are glad to have reached the agreement with Impuls LTU, which manages one of the strongest fitness chains in the Baltic states. We believe that a new shareholder will provide us with a new impulse to grow and expand. On our part, we commit to maintaining the highest-quality fitness centres possible,” said Arctic Sport Club shareholder and CEO Rein Reitalu. After the acquisition, Impuls Group will own five companies across all three Baltic states. Projected sales of Impuls LTU in 2015 are EUR 11 million. The main shareholder of Impuls LTU is BaltCap Lithuania SME Fund. Lithuania SME Fund is 20 million EUR growth capital fund organized as part of the JEREMIE initiative in Lithuania managed by the EIF and financed from the EU Structural Funds under 2007-2013 Economic Growth Operational Programme. The leading Baltic private equity fund manager BaltCap has signed an investment agreement with one of the most remarkable Latvian chocolate market players Pure Chocolate to finance fast growth of the company. Pure Chocolate is a chocolate truffles and other chocolate products producer with a strong market position in Latvia and sales to 20 export markets globally. The company reached EUR 3.35 million turnover in 2014. The fast growth story of Pure Chocolate has been based on high quality chocolate products, professional team and strong brand. “We are very satisfied with reaching an agreement with BaltCap. Additional investment will help us accelerate our growth, strengthen Pure Chocolate brand in existing markets as well as pursue new export markets,” says Pēteris Žimants, Chairman of the Board of Pure Chocolate. “We are happy to announce that our talks with Pure Chocolate have resulted in a signed cooperation agreement. In our eyes, Pure Chocolate is a very attractive player in food sector with a large growth potential. The company combines several factors crucial for success – experienced entrepreneurs, high quality products, well-established brand and growing industry. We are honored that Pure Chocolate has chosen BaltCap as a partner for further growth and we believe that fueled with BaltCap investment and contact network, Pure Chocolate will continue to grow at a fast pace,” adds Astra Neimane, Investment Director at BaltCap. Pure Chocolate is a comparatively new brand of sweets that has rapidly managed both to win the hearts of Latvian consumers and make convincing steps in other countries. The company is a striking example of how to use state support by means of financial instruments for growth at stable development stage: development loan for expanding production, export loan guarantees for mastering new markets and attracting risk capital to provide pace of growth for a prolonged period,” notes Rolands Paņko, Chairman of the Board of ALTUM. Development Finance Institution ALTUM is the largest investor of the BaltCap Latvia Venture Capital Fund. ALTUM provides state support through a full range of financial instruments: loans, credit guarantees, mezzanine loans and co-invests in risk capital funds. Support for the companies is available during all stages of growth starting from the idea and commencing operation until stable growth. TRAFI, public transport journey navigation app, has announced today a $6.5m series A funding round led by Octopus Investments and EBRD. The funding will be used to expand into new high-growth emerging markets. TRAFI app (http://www.trafi.com) provides most accurate urban commuting planning tool by using its unique algorithms and crowd-sourced real-time data. Founded by four Lithuanian entrepreneurs in 2013, TRAFI focuses on high-growth emerging markets and currently is available in Turkey, Lithuania, Latvia, Estonia and Brazil. TRAFI was listed in Apple’s highly regarded ‘Best apps of 2014’. The newly raised funding will enable TRAFI to launch its product in new emerging markets, scale the team in Vilnius, open London office and further develop the proprietary back-end system. The round was led by Octopus Investments and EBRD venture capital fund. Octopus Investments is also a lead investor in another BaltCap’s portfolio company YPlan, London-based mobile marketplace for local events. For EBRD Venture Capital Investment Programme it is the first investment in the Baltic tech industry. BaltCap invested in TRAFI in 2014 and participated also in current round as well as the seed investor Practica Capital. In addition, Lithuanian serial entrepreneur Mantas Mikuckas, the co-founder and COO of Vinted is an advisor and angel investor in TRAFI. “We are convinced that the TRAFI team has all the requisite ingredients – superior product, international experience and global ambitions, and we are very excited to be working with one of the most talented teams in Lithuanian tech space,” said Kornelijus Celutka, Investment Director at BaltCap. Lithuania SME Fund is a growth capital fund established by BaltCap as part of the JEREMIE initiative in Lithuania. Total size of the Fund is €20 million; its portfolio involves 8 companies including Impuls, Coffee Inn, Labochema, YPlan and others. JEREMIE Holding Fund managed by the EIF is financed from the EU Structural Funds under 2007-2013 Economic Growth Operational Programme. BaltCap has signed an agreement to invest €1.5 million in the development of 24MW wind farm near Jurbarkas. The wind farm is expected to be operational in the second half of 2015. BaltCap has sold its 48% shareholding in the Latvian-based innovative concrete floor production company LLC Primekss. “During BaltCap’s tenure Primekss successfully expanded internationally becoming one of the leading concrete contractors in Scandinavia and the Baltic States and licensing its technology across the USA, Belgium, South Africa, Belarus, Russia, Israel. Primekss is a success story showing how a Latvian company with an innovative product offering can rapidly expand its business in foreign markets with the help of venture capital. We hope that the example of Primekss will inspire and encourage other entrepreneurs to attract venture capital for business development,” said Investment Director of BaltCap, Peteris Treimanis expressing his satisfaction regarding the exit. Latvian Guarantee Agency (LGA) is also satisfied with such result. “Management of Primekss has proved that technologies able to conquer global markets can be created here, in Latvia. This is an example of how challenges in the construction sector can be solved by improving quality of finished concrete floors and simultaneously saving both the materials used during construction and the consumed energy. One of the preconditions for the companies to be able to fulfill these innovative and export-oriented ideas is the possibility to attract investments,” said Mr. Ivars Golsts, Director of LGA. BaltCap invested 1.4 million euros in Primekss in 2010 obtaining 47.9% of the shares. This was the first investment made from BaltCap Latvia Venture Capital Fund established in the same year within the JEREMIE initiative co-financed by the European Union Structural funds. Primekss, founded in 1997, is a highly innovative concrete specialist based in Riga, Latvia with offices and licensees across the globe. Through its R&D efforts Primekss constantly continues to improve concrete. The company has twice received the prestigious Most Innovative Product award at World of Concrete in Las Vegas for its PrimeComposite floors and rafts, and has been a recipient of numerous prizes for innovation, in addition to other accolades across Europe. PrimeComposite enables a reduction in CO2 emissions from concrete production of more than 30 percent. The leading Baltic private equity and venture capital investment management company BaltCap has signed an investment agreement of EUR 1.5 million with one of the most successful Latvian cosmetics producers and franchise developers STENDERS. STENDERS is a cosmetics producer with 225 franchise stores in 23 countries worldwide. It is particularly strongly represented in China and Russia, revenues from these markets comprising more than half of the company’s turnover. The success story of the brand has been based on high quality products and special packaging, service culture, design of the stores and the successful franchise concept, which has helped to attract over 60 professional franchise partners over the period of 12 years of operation. The product assortment of STENDERS includes more than 320 bath, body, face and hair care products. “Producing innovative high quality articles, STENDERS has become one of the strongest brand based businesses in Latvia and is now widely represented in the world. We see large potential for fast development in the markets of CIS and Asia by continuing the path that STENDERS has taken. We are honoured to be part of the shareholders and support the management’s ambitious growth plans,” said Astra Neimane, Investment Director of BaltCap. “We have been trying to attract an investor for some time now, in order to allow the company to achieve the ambitious plans of conquering new markets and new product development more successfully and efficiently. But all that requires big investments. This is one of the first steps of attracting investments since STENDERS aims to reach the vision of becoming a well-known cosmetics brand outside Latvia,” added the CEO and Board Member of STENDERS, Jānis Bērziņš. BaltCap, the leading private equity and venture capital firm in the Baltics, has signed an 1.5m EUR investment in PostService Group, the leading Latvian private postal operator and developer of automated last mile delivery solutions. PostService Group is the largest privately-owned postal operator in Latvia and the market leader of unaddressed mail. With forty “Mana Pasta Stacija” parcel delivery and shipment terminals in all largest cities, PostService Group is the leading operator of automated parcel delivery and shipment terminals. In addition, the Group develops and exports automated parcel terminals to satisfy the needs of other postal operators and courier companies as well as companies from other industries where parcel deliveries are crucial. “As the amount of online purchases grows rapidly, so does the demand for convenient and effective delivery of goods purchased online. With more than ten years of experience in the postal industry, PostService Group has excellent growth potential – not only in the local postal and parcel delivery market but also in the export markets as a developer of automated last mile delivery solutions. We are excited about being able to support the experienced team of PostService Group on the way to achieving their goals,” said Janis Pranevics, Associate Director at BaltCap. “We have ambitious plans for the Latvian postal and courier market and we also aim to bring our export business to a whole new level,” said Nadezda Razumova, owner and Chairwoman of the Management Board at PostService Group. “I believe that synergy with BaltCap will yield good results in the near future and together we will create a success story for both companies. Experience from our co-operation, which so far has been relatively short but intense and valuable, confirms that,” she added. BaltCap invests in Coffee Inn, the largest branded coffee shop chain in the Baltics. Coffee Inn intends to invest up to €2 million of debt and equity capital over the coming two years to finance the future growth of the business in Lithuania and other countries. Coffee Inn (www.coffee-inn.lt) was established in Vilnius in 2007 by the group of Lithuanian entrepreneurs. Today, the company operates 28 branded coffee shops and expects to have sales over €3 million in 2012. Coffee Inn shops are located in Vilnius, Kaunas, Klaipeda, Palanga, Siauliai and Riga, Latvia. “We believe that Coffee Inn has the strongest growth potential among local chains of branded coffee shops in the Baltics. We look forward to working with the competent management team of the company, who has demonstrated an impressive record over the last four years in both expanding the chain across Latvia and Lithuania and building highly loyal customer base.” said Kornelijus Celutka, Investment Director at BaltCap. This marks Lithuania SME Fund’s sixth investment. Earlier, the Fund has already invested into: Ygle, building engineering systems solution and service provider, Impuls LTU, the largest health club operator in Lithuania, Labochema, the leading pan-Baltic laboratory supplies provider, Seimos Medicinos Klinika, chain of primary care clinics and YPlan, event booking mobile app in London. Lithuania SME Fund is a growth capital fund established by BaltCap in 2010 as part of the JEREMIE initiative in Lithuania. Total size of Lithuania SME Fund is EUR 20 million and it provides growth equity financing up to EUR 3 million per company for small- and medium-sized enterprises. BaltCap, the leading private equity and venture capital firm in the Baltics, has invested 800,000 euros in Amateks – producer of metal components and complementary parts. This is already the fourth investment this year which has been performed by BaltCap with private and European Structural funds financing. It is expected that investment will be used for production expansion and modernization. „Amateks is a good example that high quality production combined with a strict observance of the delivery dates and responsiveness to customer needs are important prerequisites for attracting international customers. The company’s hallmark in the last ten years is successful collaboration with global companies such as Schneider Electric, CERTEX, Concentric AB and Plockmatic,” says the Investment Director of BaltCap Astra Neimane. Explaining the investment decision of BaltCap, Astra Neimane indicates that experience of the company’s management team, accumulated over nearly thirty years of work in the industry, was a crucial factor. The investment will extend Amateks’ product range and allow rapid growth of revenues, fueled both by servicing existing clients and working on a attracting new ones. “With venture capital funding, we plan to expand and modernize our manufacturing facilities to meet the evolving needs of our existing customers and to attract new global customers. In addition, we are satisfied that BaltCap will participate not only with money but also with serious management experience and knowledge, as well as their extensive international contact network, “said Chairman of the Board and owner of Amateks, Aivars Gudakovskis. Supervisory Board of Amateks will also be strengthened with an addition of an experienced industry professional, Hanzas Elektronika vice president Alvis Vagulis. Previously he led the Lexel Fabrika, a subsidiary of Schneider Electric in Latvia. Amateks is a metalworking company that offers lathing, milling and welding services using high precision and effective equipment. Last year the company worked with a turnover of one million euros. BaltCap, the largest private equity and venture capital investor in the Baltic countries, completed a growth capital investment in Seimos Medicinos Klinika (“SMK”), an operator of primary care and family doctor clinics in Lithuania. This is the second investment completed by BaltCap’s Lithuania SME Fund this month. Established in 2004, the Company operates 6 primary care clinics in Taurage, Marijampole, Lentvaris and three residential areas of Vilnius (Riese, Dvarcionys and Lazdynai). Across the chain, SMK has more than 17 thousand registered patients and employs 100 doctors and other professionals. “We have identified private healthcare services in Lithuania as a strong and sustainable growth opportunity and believe that SMK, with its track-record of medical excellence, strong management and well-established corporate governance, represents an attractive consolidation platform in this market,” said Kornelijus Celutka, Investment Director at BaltCap. Lithuania SME Fund is a growth capital fund organized by BaltCap in 2010 as part of the JEREMIE initiative in Lithuania. JEREMIE Holding Fund managed by the EIF is financed from the EU Structural Funds under 2007-2013 Economic Growth Operational Programme. Total size of Lithuania SME Fund is EUR 20 million and it provides growth equity financing up to EUR 3 million per company for small- and medium-sized enterprises based in Lithuania. Earlier, Lithuania SME Fund has invested into Ygle, building engineering systems solution and service provider, Impuls LTU, the largest health club operator in Lithuania, YP MobileWorks, mobile commerce company. The leading venture capital company in the Baltic States BaltCap has agreed with the garden furniture production company EKJU on investment in amount of 1.5 million euros. It is expected that the investment will be made in modernization of the company’s production unit and working capital. “Already now 95% of company’s production is being exported. With the management of the company we have agreed that EKJU needs to strengthen its positions and in medium term it must become one of the leading European companies in its segment. The goal is ambitious enough but with our business knowledge and financing we are sure that we can achieve it,” says Investment Director of BaltCap Peteris Treimanis. Now EKJU is exporting its production to Great Britain, Denmark, France, Sweden, Norway, Ireland, Spain and the Netherlands. Peteris Treimanis believes that in Latvia there are all preconditions for the company to be among leaders in Europe. “Latvian timber is a raw material of good quality and available for production; we have also highly-skilled employees who can produce an offer meeting the needs of the export market,” says Peteris Treimanis. “By attracting a venture capital company to our development, we acquire not only financing but also serious experience in the management of a production company, as well as valuable international contacts,” explains the Head of EKJU Juris Skolins commenting on the company’s development plans. The BaltCap investment project is being implemented with investment of private investors and financing of European Union structural funds administered by the Latvian Guarantee Agency. Director of the LGA Ivars Golsts emphasises that investment in an exporting company with ambitious development plans is an excellent example of effective use of state aid. Up to now, BaltCap has attracted financing for 7 investment projects within the framework of the state supported programme. SIA EKJU is the biggest garden furniture producer in the Baltic States employing more than 180 people. The administrative office of the company is in Riga but production units are in Cesis district, Drebesi parish. In 2011 the company’s turnover was 6.8 million euros which is 13% more than a year before that. BaltCap, the leading venture investor in the Baltics, has signed an EUR 1 million investment in Clusterpoint, an ultra-fast database management system with built-in Internet-style search functionality. The company is an enterprise software start-up created by Latvian programmers and backed by seed investors from the UK and the Baltics. Clusterpoint has built a highly scalable database platform designed for cloud computing infrastructure. Clusterpoint’s database software provides superior performance on modest hardware so that it delivers greater energy-efficiency in data centres. The company has paying customers and revenue and will use BaltCap’s investment to expand internationally, including hiring senior management in the US. Gints Ernestsons, Clusterpoint’s co-founder and CEO, stated: “Our customers like how Clusterpoint adds value to their data-intensive businesses while reducing the number of transactions required to access relevant data. Clusterpoint’s software is particularly well suited to cloud computing and data centres looking to improve performance and cost-efficiency. Our team of top class programmers has designed and built a compelling product comprising natively scalable NoSQL database software with lightning-fast integrated full-text search in structured and unstructured data. Our unique ranked indexing method delivers nearly linear database scalability in clusters. We look forward to working with BaltCap during our next growth phase.” “We are impressed by the strength of the technology that Clusterpoint has built, with the expert competence of the founders and team, and we believe that Clusterpoint can scale into a highly successful international business,“ said Mārtiņš Jaunarajs, Investment Director at BaltCap. BaltCap Latvia Venture Capital Fund investing in Clusterpoint comprises commitments from private investors as well as from the EU-sponsored JEREMIE programme which is administered by the Latvian Guarantee Agency. BaltCap, the leading private equity and venture capital investor in the Baltic States invests EUR 0.5 m into Latvian business “Vendon” which produces monitoring systems and solutions for vending machines. Vendon is a draugiem.lv group company supplying international and local vending machines with Latvian-produced equipment and solutions with support of telemetry systems. This allows to follow capital and product flow in the machines as well as efficiently receive information about damages or other technical problems, thus dramatically optimizing human resources and transportation-related losses. “We’re proud to be one of the few in the world who have developed such solutions which are already highly appreciated and recognized by our current customers. All processes – programming and equipment production – happen in Latvia, thus adding value to local economy. This investment will offer us faster development, providing new employment vacancies and organizing active international selling. I’m sure that we’ll create a new export success story for Latvia,” says Vendon’s Sales Director in Europe Georges A. Cywie. BaltCap’s financing is made up of private investor contributions as well as European Union Structural Funds money which is administered by the Latvian Guarantee Agency. “We are truly delighted by the opportunity to support experienced professionals from the Vendon team in their ambitious plans. Currently, these types of solutions are not extensively developed in Europe. That’s why we belive that Vendon, with their user-friendly solutions and experienced team will help to create effective telemetry solutions,” declares Martins Jaunarajs from BaltCap. “State-supported investments in innovative and quickly growing companies such as Vendon are our priority. We foresee true business success and a return on investment in the future. By bringing together Vendon and Baltcap professionals’ knowledge, it will certainly succeed,” commented Ivars Golsts, director of the Latvian Guarantee Agency. Lithuania SME Fund managed by BaltCap, the largest private equity and venture capital investor in the Baltic countries, completed a growth capital investment in Labochema, the leading pan-Baltic laboratory supply provider. This is the third investment made by BaltCap’s Lithuania SME Fund. Labochema (consisting of Labochema LT, Labochema Latvija and Labochema Eesti) is the leading provider of laboratory supplies and related services in the Baltics. Founded in 1991, the company is currently located in Vilnius, Riga and Tartu. Labochema provides customers with a wide range of products including chemicals, reagents, furniture, equipment, instrumentation and consumables from leading global scientific manufacturers. Labochema’s client portfolio consists of top educational, biotech, industrial, pharmaceutical, health care and governmental organizations. Along with the new equity investment, Siaulių bankas will provide a new loan facility to Labochema. Earlier, Lithuania SME Fund has invested into Ygle, building engineering systems solution and service provider, and Impuls LTU, the largest health club operator in Lithuania. Lithuania SME Fund managed by BaltCap, the largest private equity and venture capital investor in the Baltic countries, has invested in Impuls LTU, operator of the leading Lithuanian health and fitness club chain. With 8 gyms in Lithuania’s main towns, Impuls LTU will be the largest health club chain in the country. Impuls LTU operates only large format clubs the size of which ranges from 2000 sq. meters to 6600 sq. meters. Impuls clubs offer their clients main workout and cardio areas, group exercise classes and pools as well as additional products and services. The investment should support an aggressive expansion of the chain, both organic and through add-on acquisitions. Lithuania SME Fund is a growth capital fund organized by BaltCap in 2010 as part of the JEREMIE initiative in Lithuania. JEREMIE Holding Fund in Lithuania managed by EIF is financed from the EU Structural Funds under 2007-2013 Economic Growth Operational Programme. Total size of Lithuania SME Fund is EUR 20 million, EUR 14 million of which is provided by JEREMIE Holding Fund and EUR 6 million by leading Baltic financial institutions, including SEB Venture Capital, asset management companies of LHV, Swedbank and DnB. The Fund provides growth equity financing for small- and medium-sized enterprises based in Lithuania up to EUR 3 million per company. This is the second investment by Lithuania SME Fund in the country in 2011. Earlier this year, the fund has invested into Ygle, building engineering system solution and service provider. BaltCap, the leading private equity and venture capital investor in the Baltic States, invests EUR 1.5 m in Riga-headquartered IT company AGroup to obtain a significant minority stake. This investment is done by BaltCap Latvia Venture Capital Fund which is part of the EU Structural Fund’s co-financed JEREMIE Holding Fund managed by the European Investment Fund in Latvia. AGroup, established in 2008, is a developer of human resource management solution HRB with more than 500 installations in 24 countries. HRB is a flexible and easy localizable product that integrates smoothly with all leading ERPs as Oracle, SAP, Sun Systems, Microsoft Dynamics NAV, etc. Currently, HRB offers core HR functionality (payroll calculation, work time recording, etc) while the new version of software will add new strategic functions such as talent management, recruiting management and personnel evaluation. “We are proud and very excited about being able to support the skilled team of AGroup in their ambitious growth plans. AGroup is one of the leading HRM solution providers in CIS and Eastern European countries, and this is a unique opportunity for our fund to back a software company with truly international reach and strong foothold in a fast growing market,” says Mārtiņš Jaunarājs from BaltCap. “Co-operation with the leading Baltic venture capital investor is a big leap forward as it boosts our growth rates significantly. The investment helps us to finish the development of fifth version of our HRB product and enables delivery using Software as a Service model (Saas). Also, we will strengthen our sales team, expand the partner network and ramp up the marketing efforts. We appreciate Baltcap’s faith in us and believe that together we will reach our goals”, adds Alexander Snurnitsyn, CEO of AGroup. BaltCap, the leading private equity and venture capital investor in the Baltic States, has provided financing for start-up liquid crystal display production company EUROLCDS. The aim of EUROLCDS is to create the specialised liquid crystal display production company with global customer base. This investment has been completed within the EU Structural Fund’s co-financed JEREMIE initiative managed by the European Investment Fund in Latvia. The new enterprise based its success on experienced entrepreneurs team as well as on co-owner’s – LC-TEC AB (Sweden) – long term experience and contacts in production and R&D of liquid crystal displays. The potential customers are industrial and medicine equipment producers and sellers of EU countries, USA and Japan that use liquid crystal displays elements as parts for their products. As most demanded liquid crystal display application today, stereoscopic and volumetric 3D video projection equipment can be mentioned. “We are delighted for the opportunity to finance the development of a new enterprise, competitive advantage of which is based on world class technology, patented products and new product development opportunity. We are also happy to provide new vacancies in global sales based company and to create additional motivation for young students to study engineering sciences,” said Peteris Treimanis, Investment Director at BaltCap. “Decision to establish the company in Latvia is a significant step for developing know-how based economy since it creates an opportunity for engineers’ intelligence to participate in one of the world’s hi-tech development streams. It is also very important for our potential customers that we are part of European Union and able to provide security on both -intellectual property and patented technology solutions,” added Ilmars Osmanis, Board Member of EUROLCDS. BaltCap, the leading private equity and venture capital investor in the Baltic States, has provided financing for start-up of the corporate media production company Oobelisk, gaining a majority stake in the company. The aim of Oobelisk is to become the leading player in Eastern and Northern Europe in this sector. This investment has been completed within the EU Structural Fund’s co-financed JEREMIE initiative managed by the European Investment Fund in Latvia. Oobelisk management team are long-term professionals in the media and TV production business. Capitalizing on previous experience in the sector, the company is planning to offer unique range of corporate media products, ranging from audio visual annual reports and yearbooks to interactive presentations. The potential clients of Oobelisk are Baltic, Northern and Eastern European leading companies, for which the corporate image, as well as communication with shareholders, employees and society is of upmost importance. “We are delighted for the opportunity to finance development of the innovative products developed by Oobelisk’s professional management team. We believe there is large market demand for such products by corporate clients and the company has good chances to become a leading player in the corporate media production business in the Baltic States and the neighbouring markets,” said Astra Neimane, Investment Director at BaltCap. “On behalf of Oobelisk we are very honoured to see BaltCap, the leading private equity and venture capital investor in the Baltic states, as our partner. The key idea behind Oobelisk is changing the old business model of media production companies and working with clients in cooperation forms new to the market. Along with development of the media space and technologies, we would be offering our clients new products which suit their communication needs the bestWeluros tiek sniegts atblasts utsourcinga l”, said Kristaps Pētersons, Chairman of the Board and Business Development Director of Oobelisk, describing the uniqueness of Oobelisk.